The DGS-3324SR is the first in a new series of “Next Generation” high performance stackables from D-Link Systems. The DGS-3324SR blends many features typically found in more expensive chassis based solutions, (high density, hot swap, redundant power options, and high performance) with the price and flexibility of a stackable. D-Link’s xStack Switches Series is a set of “Next Generation” high performance stackable switches that deliver high scalability, wire-speed Gigabit performance, high availability, integrated 10-Gigabit stacking, redundant power option, and support for stacking in a “ring” or “star” topology (requires DGS-3324SRi as stacking master). The DGS-3324SR blends many features typically found in more expensive chassis based solutions with the price and flexibility of a stackable switch. When stacked in a ring configuration, it provides up to 384 Gigabit ports. 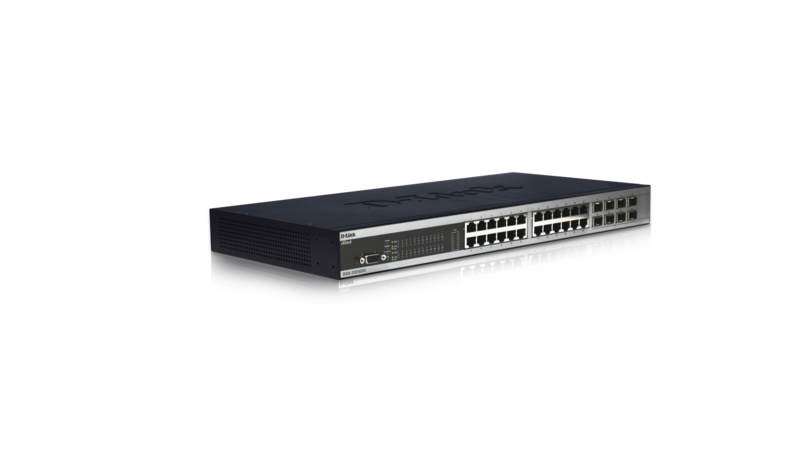 It also stacks with the other xStack™ Series switches including the DGS-3324SRi, DXS-3350SR, and DXS-3326GSR to provide unprecedented flexibility in a switch stack environment. The xStack™ DGS-3324SR is a 24-Port 10/100/1000BASE-T Managed Stackable Multilayer Switch with (4) combo ports supporting SFP transceivers. It has an 88Gbps switching capacity and supports dual integrated 10-Gigabit stacking ports for up to 40Gbps of full-duplex stacking bandwidth. Its architecture supports stacking of up to 12 units* using the integrated rear 10-Gig stacking ports in a “Shortest-Path, Fail-Safe” ring configuration. Each unit also supports an optional redundant power supply (DPS-500). Other features include support for 802.3ad Link Aggregation, 802.1d Spanning Tree, 802.1w Rapid Spanning Tree, and 802.1s Multiple Spanning Tree for increased network reliability and availability. An extensive set of network management features is supported including console CLI, telnet, web, SNMPv1/v2/v3, RMON, TFTP, Port Mirroring, BootP, and DHCP. The switch can also be easily managed using D-Link’s SIM (Single IP Management) Clustering technology for a virtual stack of up to 32 switches. It also provides a variety of advanced traffic management options including 802.1x, Bandwidth Control, Broadcast Rate Limiting, and support for IGMP Snooping v1/v2/v3. The xStack™ DGS-3324SR implements a robust and consistent set of QoS/CoS, VLAN, and Security features. It supports 8 priority queues for 802.1p/ToS/DiffServ, with classification and marking based on MAC SA/DA, IP SA/DA, and/or TCP/UDP port numbers. Layer 3 dynamic routing protocols include RIPv1/v2, OSPFv2, PIM-DM, PIM-SM, DVMRP, and VRRP. Security features include 802.1x Port Based Authentication 802.1x MAC Based Authentication , and Access Control Lists based on MAC address, IP address, TCP/UDP port numbers, and IPv6 address and traffic class. The DGS-3324SR also has extensive support for GARP/GVRP, 802.1q, 802.1v IPv6 VLAN, and port based VLANs for up to 4000 groups. The xStack™ DGS-3324SR is the latest example of D-Link’s continued commitment to our channel partners and customers to be the industry leader in delivering cost-effective, reliable, high performance, feature-rich switches. * Maximum number of units in a stack may vary depending on model and configuration.